We prioritize the safety of our users and recognize the additional risk caused by a delay in the implementation of the distrust plan. However, given the current situation, we believe that delaying the release of this change until later this year when more sites have replaced their Symantec TLS certificates is in the overall best interest of our users. This change will remain enabled in Nightly, and we plan to enable it in Firefox 64 Beta when it ships in mid-October. We continue to strongly encourage website operators to replace Symantec TLS certificates immediately. Doing so improves the security of their websites and allows the 10’s of thousands of Firefox Nightly users to access them. Mozilla Security continuously reviews and tests the security of Firefox, but external verification is a critical part of our operations security strategy. We are glad to say that X41 did not find any critical flaw in AUS, but they did find various issues ranking from low to high, as well as 21 side findings. X41 D-Sec GmbH found the security level of AUS to be good. No critical vulnerabilities have been identified in any of the components. The most serious vulnerabilities that were discovered are a Cross-Site Request Forgery (CSRF) vulnerability in the administration web application interface that might allow attackers to trigger unintended administrative actions under certain conditions. Other vulnerabilities identified were memory corruption issues, insecure handling of untrusted data, and stability issues (Denial of Service (DoS)). Most of these issues were constrained by requiring to bypass cryptographic signatures. Three vulnerabilities ranked as high, and all of them were located in the administration console of Balrog, the backend service of Firefox AUS, which is protected behind multiple factors of authentication inside our internal network. The extra layers of security effectively lower the risk of the vulnerabilities found by X41, but we fixed the issues they found regardless. X41 found a handful of bugs in the C code that handles update files. Thankfully, the cryptographic signatures prevent a bad actor from crafting an update file that could impact Firefox. Here again, designing our systems with multiple layers of security has proven useful. Today, we are making the full report accessible to everyone in an effort to keep Firefox open and transparent. We are also opening up our bug tracker so you can follow our progress in mitigating the issues and side findings identified in the report. Finally, we’d like to thank X41 for their high quality work on conducting this security audit. And, as always, we invite you to help us keep Firefox secure by reporting issues through our bug bounty program. To compensate, the HTTP Referrer Policy allows webpages to gain more control over referrer values on their site. E.g. using a Referrer Policy of “origin” instructs the web browser to strip any path information and only fill the HTTP referrer value field with the origin of the requesting webpage instead of the entire URL. More aggressively, a Referrer Policy of ‘no-referrer’ advises the browser to suppress the referrer value entirely. Ultimately the Referrer Policy empowers the website author to gain more control over the used referrer value and hence provides a tool for website authors to respect an end users privacy. While Firefox has been supporting Referrer Policy since Firefox 50 we are happy to announce that Firefox will expand policy coverage and will support Referrer Policy within style sheets starting in Firefox 64. With that update in coverage, requests originating from within style sheets will also respect a site’s Referrer Policy and ultimately contribute a cornerstone to a more privacy respecting internet. Mozilla recently published version 2.6.1 of our Root Store Policy. The first action confirms that CAs have read the new version of the policy. The second action asks CAs to ensure that their CP/CPS complies with the changes that were made to domain validation requirements in version 2.6.1 of Mozilla’s Root Store Policy. CAs must confirm that they will comply with the new requirement for intermediate certificates issued after 1-January 2019 to be constrained to prevent use of the same intermediate certificate to issue both SSL and S/MIME certificates. 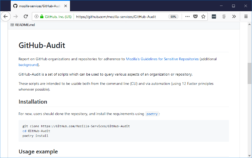 CAs are reminded in action 4 that Mozilla is now rejecting audit reports that do not comply with section 3.1.4 of Mozilla’s Root Store Policy. CAs are reminded of their obligation to add new intermediate CA certificates to CCADB within one week of certificate creation, and before any such subordinate CA is allowed to issue certificates. Later this year, Mozilla plans to begin preloading the certificate database shipped with Firefox with intermediate certificates disclosed in the CCADB, as an alternative to “AIA chasing”. This is intended to reduce the incidence of “unknown issuer” errors caused by server operators neglecting to include intermediate certificates in their configurations. In action 7 we are gathering information about the Certificate Transparency (CT) logging practices of CAs. Later this year, Mozilla is planning to use CT logging data to begin testing a new certificate validation mechanism called CRLite which may reduce bandwidth requirements for CAs and increase performance of websites. Note that CRLite does not replace OneCRL which is a revocation list controlled by Mozilla. The full action items can be read here. Responses to the survey will be automatically and immediately published by the CCADB. With this CA Communication, we reiterate that participation in Mozilla’s CA Certificate Program is at our sole discretion, and we will take whatever steps are necessary to keep our users safe. Nevertheless, we believe that the best approach to safeguard that security is to work with CAs as partners, to foster open and frank communication, and to be diligent in looking for ways to improve. At Mozilla, we’ve been working to ensure our repositories hosted on GitHub are protected from malicious modification. As the recent Gentoo incident demonstrated, such attacks are possible. Mozilla’s original usage of GitHub was an alternative way to provide access to our source code. Similar to Gentoo, the “source of truth” repositories were maintained on our own infrastructure. While we still do utilize our own infrastructure for much of the Firefox browser code, Mozilla has many projects which exist only on GitHub. While some of those project are just experiments, others are used in production (e.g. Firefox Accounts). We need to protect such “sensitive repositories” against malicious modification, while also keeping the barrier to contribution as low as practical. This describes the mitigations we have put in place to prevent shipping (or deploying) from a compromised repository. We are sharing both our findings and some tooling to support auditing. These add the protections with minimal disruption to common GitHub workflows. The risk we are addressing here is the compromise of a GitHub user’s account, via mechanisms unique to GitHub. As the Gentoo and other incidents show, when a user account is compromised, any resource the user has permissions to can be affected. GitHub is a wonderful ecosystem with many extensions, or “apps”, to make certain workflows easier. Apps obtain permission from a user to perform actions on their behalf. An app can ask for permissions including modifying or adding additional user credentials. GitHub makes these permission requests transparent, and requires the user to approve via the web interface, but not all users may be conversant with the implications of granting those permissions to an app. They also may not make the connection that approving such permissions for their personal repositories could grant the same for access to any repository across GitHub where they can make changes. Excessive permissions can expose repositories with sensitive information to risks, without the repository admins being aware of those risks. The best a repository admin can do is detect a fraudulent modification after it has been pushed back to GitHub. Neither GitHub nor git can be configured to prevent or highlight this sort of malicious modification; external monitoring is required. The following are taken from our approach to addressing this concern, with Mozilla specifics removed. As much as possible, we borrow from the web’s best practices, used features of the GitHub platform, and tried to avoid adding friction to the daily developer workflows. Sensitive repositories should only be hosted in an organization that follows the recommendations above. To not allow force pushes. Only give commit privileges to a small set of users. Enforce those restrictions on admins & owners as well. Require all commits to be GPG signed, using keys known in advance. Deployments, releases, and other audit-worthy events, should be marked with a signed tag from a GPG key known in advance. Deployment and release criteria should include an audit of all signed commits and tags to ensure they are signed with the expected keys. There are some costs to implementing these protections – especially those around the signing of commits. We have developed some internal tooling to help with auditing the configurations, and plan to add tools for auditing commits. 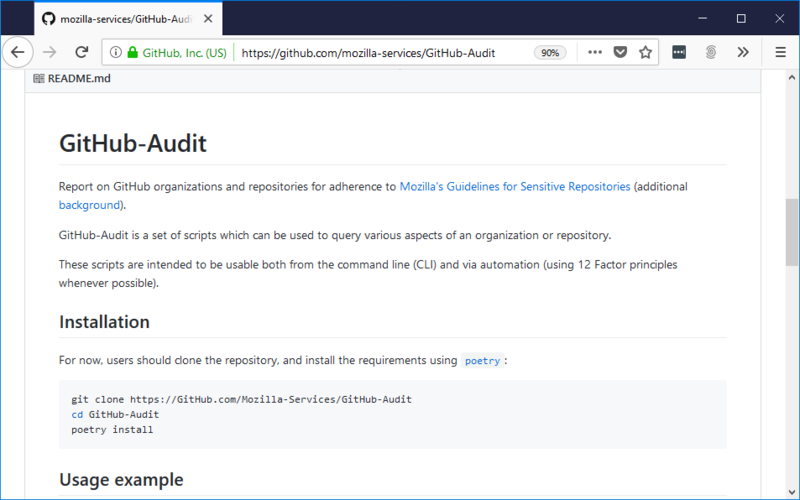 Those tools are available in the mozilla-services/GitHub-Audit repository. 2018-07-06 13:52:40,854 INFO: Gathering branch protection data. (calls remaining 4992). 2018-07-06 13:52:41,117 INFO: Starting on org octo_org. (calls remaining 4992). 2018-07-06 13:52:59,116 INFO: Finished gathering branch protection data (calls remaining 4947). We can see that only “octo_org/react-starter” has enabled protection against force pushes on it’s production branch. The final output is in CSV format, for easy pasting into spreadsheets. We are still rolling out these recommendations across our teams, and learning as we go. If you think our Repository Security recommendations are appropriate for your situation, please help us make implementation easier. Add your experience to the Tips ‘n Tricks page, or open issues on our GitHub-Audit repository. The data collected by trackers can create real harm, including enabling divisive political advertising or shaping health insurance companies’ decisions. These are harms we can’t reasonably expect people to anticipate and take steps to avoid. As such, the web lacks an incentive mechanism for companies to compete on privacy. Opt-in privacy protections have fallen short. Firefox has always offered a baseline set of protections and allowed people to opt into additional privacy features. In parallel, Mozilla worked with industry groups to develop meaningful privacy standards, such as Do Not Track. These efforts have not been successful. Do Not Track has seen limited adoption by sites, and many of those that initially respected that signal have stopped honoring it. Industry opt-outs don’t always limit data collection and instead only forbid specific uses of the data; past research has shown that people don’t understand this. In addition, research has shown that people rarely take steps to change their default settings — our own data agrees. The impact of these techniques isn’t limited to the the website that uses them; the linking of tracking identifiers through “cookie syncing” means that a single tracker which uses an invasive technique can share the information they uncover with other trackers as well. The features we’ve announced will significantly improve the status quo, but there’s more work to be done. Keep an eye out for future blog posts from us as we continue to improve Firefox’s protections. TLS 1.3 incorporates a number of important security improvements. First, it improves user privacy. In previous versions of TLS, the entire handshake was in the clear which leaked a lot of information, including both the client and server’s identities. In addition, many network middleboxes used this information to enforce network policies and failed if the information wasn’t where they expected it. This can lead to breakage when new protocol features are introduced. TLS 1.3 encrypts most of the handshake, which provides better privacy and also gives us more freedom to evolve the protocol in the future. Second, TLS 1.3 removes a lot of outdated cryptography. TLS 1.2 included a pretty wide variety of cryptographic algorithms (RSA key exchange, 3DES, static Diffie-Hellman) and this was the cause of real attacks such as FREAK, Logjam, and Sweet32. TLS 1.3 instead focuses on a small number of well understood primitives (Elliptic Curve Diffie-Hellman key establishment, AEAD ciphers, HKDF). Finally, TLS 1.3 is designed in cooperation with the academic security community and has benefitted from an extraordinary level of review and analysis. This included formal verification of the security properties by multiple independent groups; the TLS 1.3 RFC cites 14 separate papers analyzing the security of various aspects of the protocol. While computers have gotten much faster, the time data takes to get between two network endpoints is limited by the speed of light and so round-trip time is a limiting factor on protocol performance. TLS 1.3’s basic handshake takes one round-trip (down from two in TLS 1.2) and TLS 1.3 incorporates a “zero round-trip” mode in which the client can send data to the server in its first set of network packets. Put together, this means faster web page loading. TLS 1.3 was a big effort with a huge number of contributors., and it’s great to see it finalized. With the publication of the TLS 1.3 RFC we expect to see further deployments from other browsers, servers and toolkits, all of which makes the Internet more secure for everyone. Firefox 60 (the current release) displays an “untrusted connection” error for any website using a TLS/SSL certificate issued before June 1, 2016 that chains up to a Symantec root certificate. This is part of the consensus proposal for removing trust in Symantec TLS certificates that Mozilla adopted in 2017. This proposal was also adopted by the Google Chrome team, and more recently Apple announced their plan to distrust Symantec TLS certificates. As previously stated, DigiCert’s acquisition of Symantec’s Certification Authority has not changed these plans. In early March when we last blogged on this topic, roughly 1% of websites were broken in Firefox 60 due to the change described above. 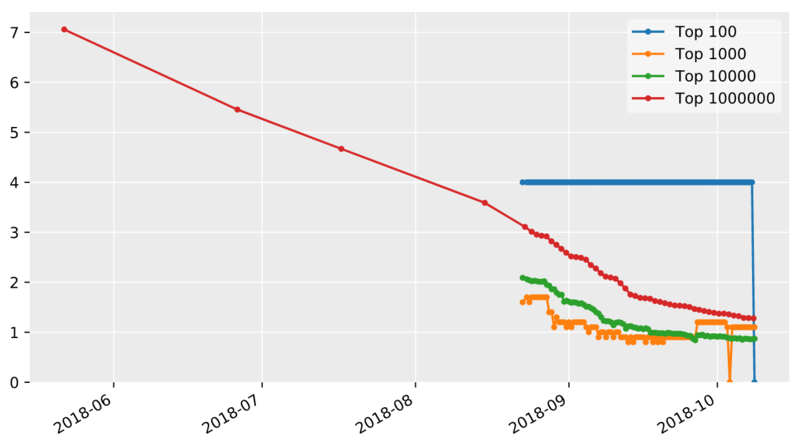 Just before the release of Firefox 60 on May 9, 2018, less than 0.15% of websites were impacted – a major improvement in just a few months’ time. We have begun to assess the impact of the upcoming change to Firefox 63. We found that 3.5% of the top 1 million websites are still using Symantec certificates that will be distrusted in September and October (sooner in Firefox Nightly)! 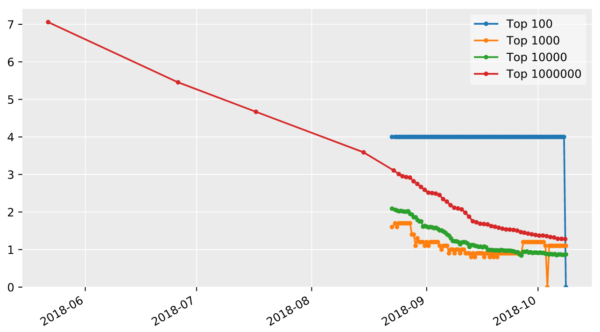 This number represents a very significant impact to Firefox users, but it has declined by over 20% in the past two months, and as the Firefox 63 release approaches, we expect the same rapid pace of improvement that we observed with the Firefox 60 release. We strongly encourage website operators to replace any remaining Symantec TLS certificates immediately to avoid impacting their users as these certificates become distrusted in Firefox Nightly and Beta over the next few months. This upcoming change can already be tested in Firefox Nightly by setting the security.pki.distrust_ca_policy preference to “2” via the Configuration Editor.